Wow! 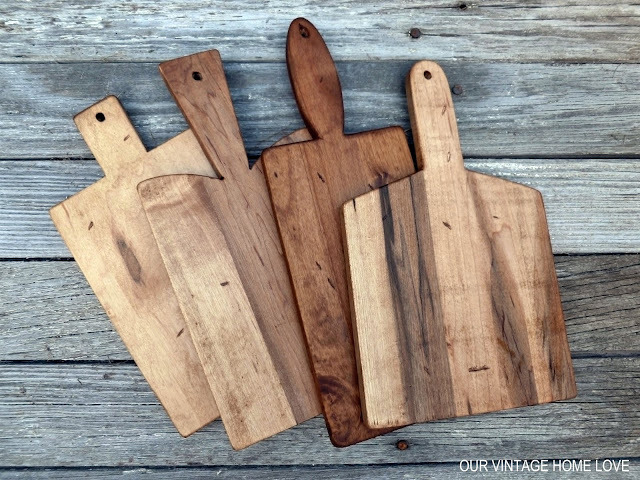 I can't believe I already sold all my bread boards! I'm still learning to use Etsy and didn't know how to alert shoppers of this but I wanted to let everyone know that I WILL have more bread boards up for sale at the end of the week! Several people have emailed me asking when I would have more. Thanks so much everyone! I feel so blessed by all the love and support I have received here in blog land! Happy Saturday! Hope you are all enjoying a fantastic weekend. 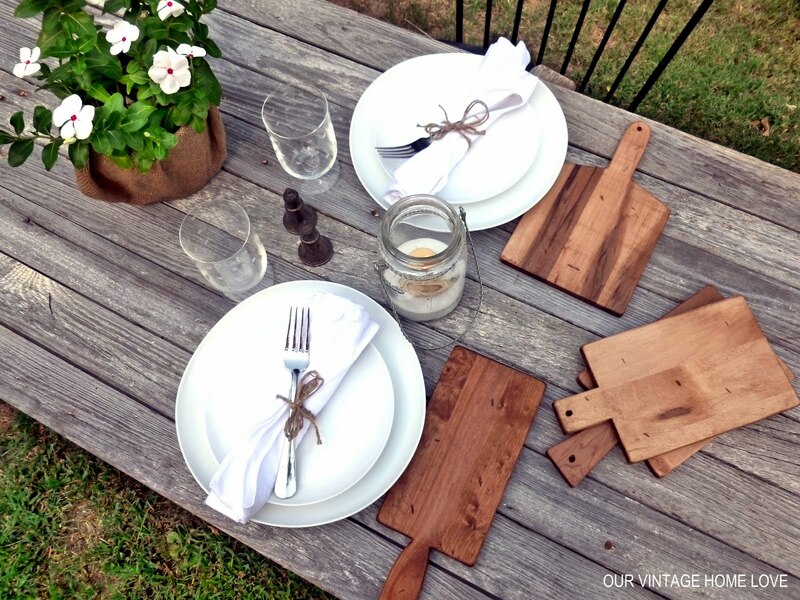 I wanted to let everyone know that I opened an Etsy shop called Vintage Home Designs. The first item/items up for sale are my mini bread boards. You can visit my shop by clicking on the Etsy Shop tab above. I just love them and really enjoy using them and hope someone else will, too! I will be selling them in sets of four. I have 5 sets for sale right now, but if you would like to special order more, just contact me. I had so much fun taking these photos in our backyard. I used an old barn door for the tabletop. I love the contrast between the barn door and the white dishes and bread board. So pretty. 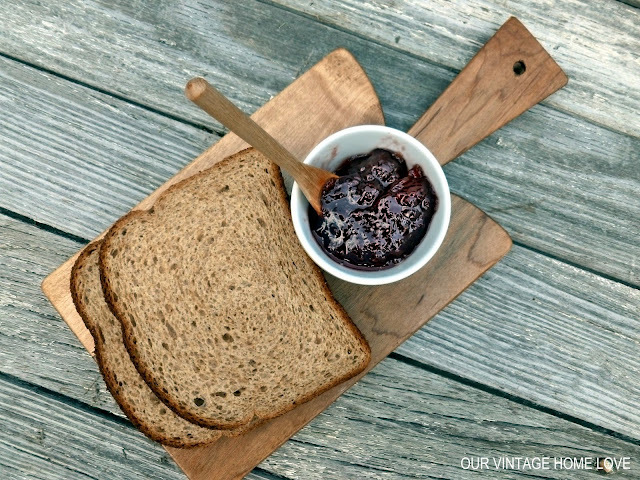 I think these are also fun for crusty Italian bread and herb butters or dipping oil. I will add more to my shop in the future. Gotta start out slow. :) I would love any suggestions! Enjoy the rest of your weekend! Hello there! It's Friday! 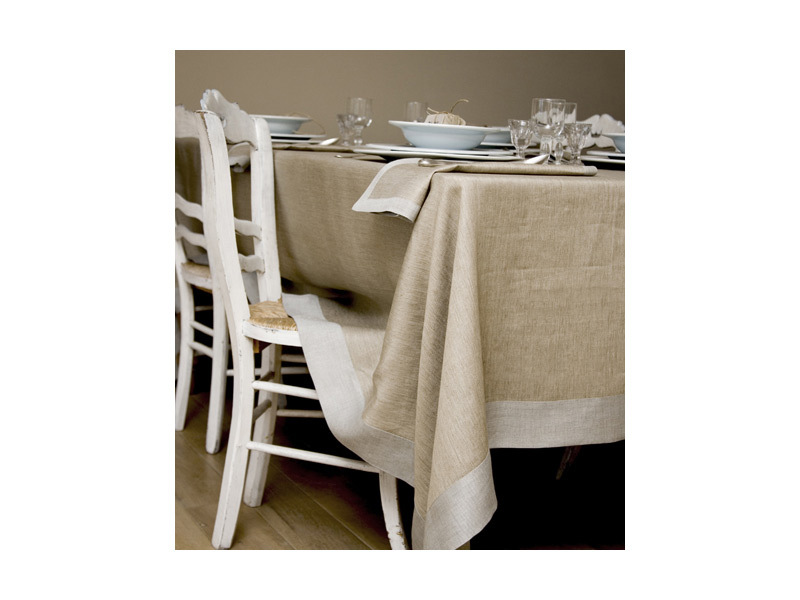 I ordered some beautiful linen fabric to make a tablecloth for my dining room table at a fantastic price and can't wait for it to arrive. You can see the fabric I ordered here. 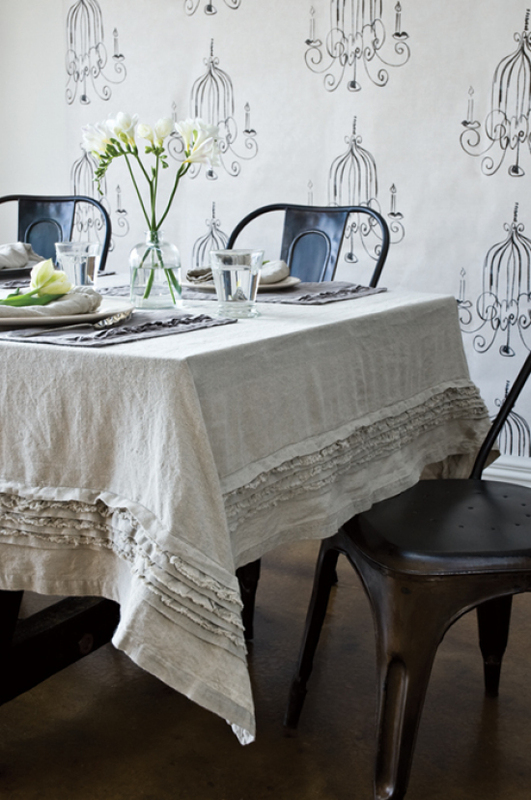 I love the look and feel of linen, it's feminine and flowy and dresses a table sumptuously. It's also expensive, unless you can find a good deal and don't need a ton. Since I only needed three yards, this was a great price. 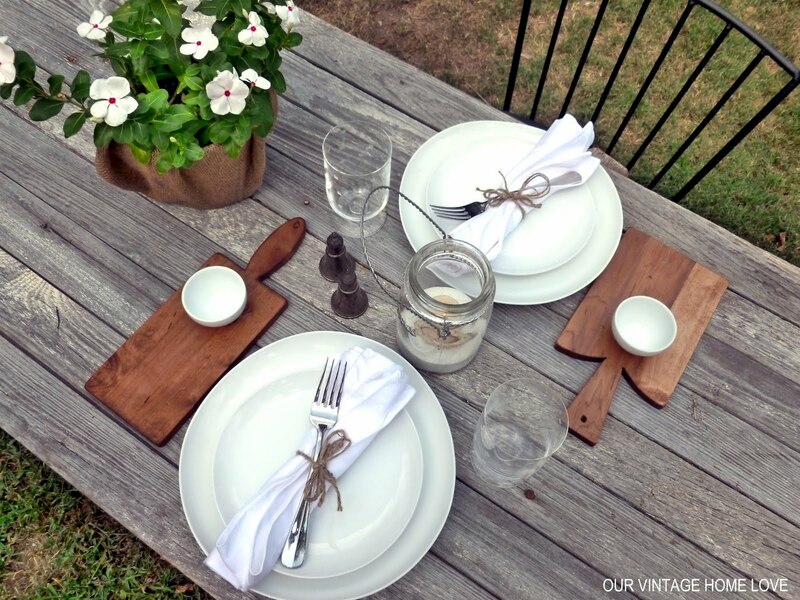 I love these inspiration pics as I'm still not certain what kind of tablecloth I will sew. Something like this one below is gorgeous. I love the trim added to the end. 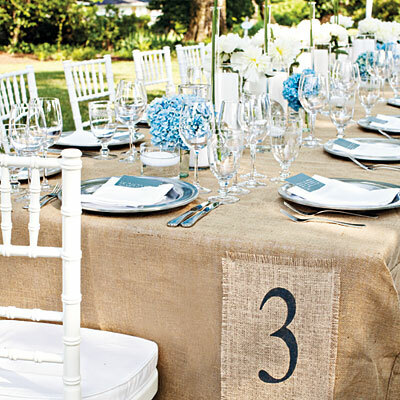 Or this, it isn't linen, it's burlap, but I LOVE the number feature on the end, even though it was probably added to designate the table. And, oh my word, this one is wonderful. Though, I don't think I could sew something like that, it sure is lovely. So, I have a couple questions I'm curious about. 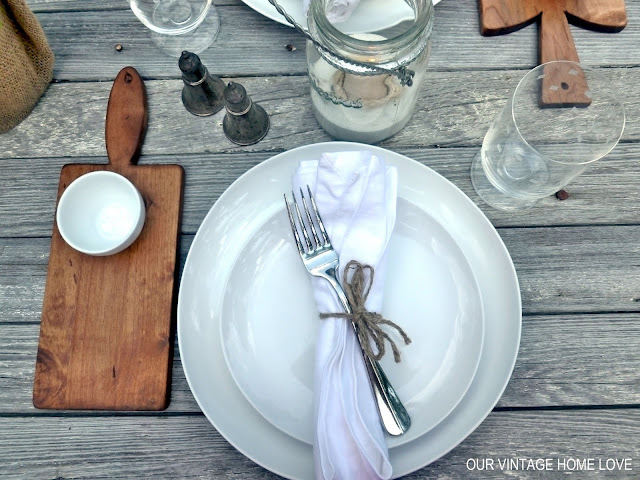 Do you use a tablecloth? 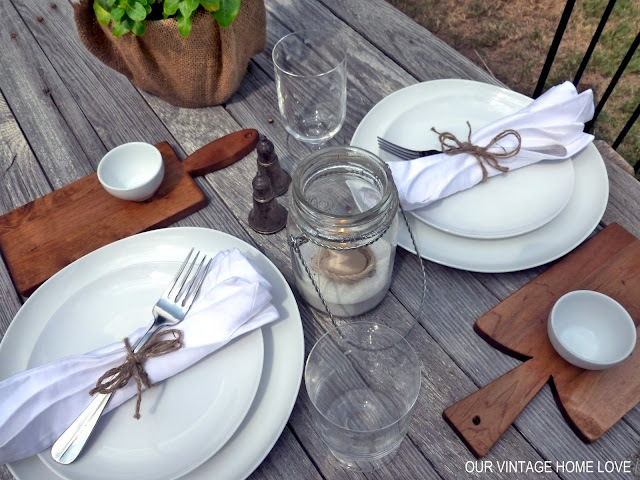 Do you keep it on your table at all times or do you only dress your table when you will be using it? I'm kinda partial to keeping linens on the table so that I can enjoy and admire them all the time, but, I'm not a fan of keeping place settings on the table, as well, to get dusty, even though I think it looks beautiful, it isn't practical in our house. How bout you? Hey there! Hope everyone is having a great week! I finally finished up the den and I am so tickled with it. I decorated the room for my hubby because it is where he likes to relax with our boys and so I thought it would be fun to fill the room with some of the things he loves most. 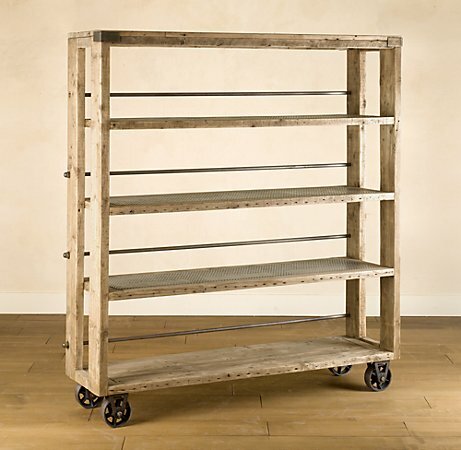 I started the redo by building this reclaimed wood shelving unit. He had asked for a unique shelf to display some of his collections. Then when he came home with this colorful minnow basket, I decided to use it for inspiration for the rest of the room. Here's what I came up with. Because of the cheerful bright colors on the minnow bucket, I chose red, white and black for the color scheme of the room. I wanted the space to have a nautical/lake house/coastal vibe to it. So, big bold stripes were perfect. I ordered the fabrics for the pillows at fabric.com. The rug I already had and purchased from Lowe's several years ago. The roman shades I made from old cheap mini blinds and drop cloth that I painted grain sack stripes on in barn red. Here is a fantastic tutorial on how to make them. This coffee table is a storage chest that my dad built for me many years ago and it's super heavy. So when hubby came home with another set of gorgeous vintage castors, I thought it would be pretty cool to attach them to the chest to make it more mobile. Plus, I love the charm it adds to a very special piece. Our den is at the base of the stairway, which is getting ready to receive a major overhaul, as well. Can't wait for that one! I painted the Boat Dock and Bait Shop sign on old barn wood and attached a fill it strip to the back. The oar came from an old barn but I added the number with grey craft paint, and gave it a bit of distressing. I was super excited about this project. 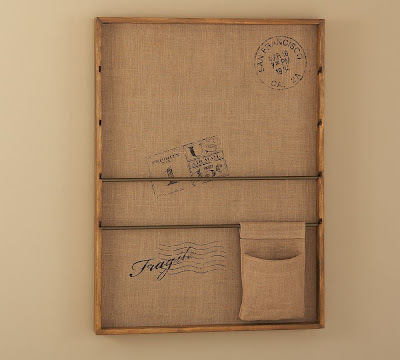 I'm sure some of you have seen this burlap board from Pottery Barn. Well, I thought it would be kinda cool to make so I bought a tri-fold foam board, covered it in canvas, then covered it in burlap and stapled everything to the back of the foam board. Then I built a frame with ripped pieces of barn wood because that is what I had, but you could also use 1 x 2's. Before I completely attached everything, I spray painted two small wood dowel rods with oil rubbed bronze spray paint, also because that is what I had on hand, drilled corresponding holes on each side of the frame and inserted the rods. Then I completed the frame and framed the rest of the board. To keep the board inside the frame, I used heavy duty staples and a staple gun. Voila! Because I had everything to make this except the foam board and dowel rods, this project only cost me 10 bucks! He's totally happy with it and it's perfect for some of the small paper items that my husband collects, like old drive in movie calenders from 1962, vintage maps and post cards, old metal movie reels, and anything else he or the boys wants to stick up there. Does anyone else think that metal movie reel looks like a steering wheel on a boat?? I also hung the vintage maps we found when we went out thrifting one weekend. This TV console is an old record player cabinet that hubby found on a picking adventure. The record player didn't work so we pulled it out and decided to use it for our TV console and game system for the kiddos. I love it, it's solid wood and didn't need anything done to it at all. I even liked the hardware. Picked this basket up at a yard sale and love it! Love the cool texture it adds to the room. The white chair is my favorite part. It used to be an everyday suede arm chair that was starting to show it's wear, so, thanks to a good friend, I got an Ektorp chair cover for only 29 bucks at Ikea. I was determined to make it fit, and I did, by golly. It fit perfectly and I was so excited! Like the kind of excited you get when you're a kid waiting for Christmas morning. :) I couldn't sleep!! For only $29, it's like we got a completely new chair! And I've heard that you just throw them in the wash and bleach them when they get dirty. We're both super happy about the room and he finally has a place to display the things he loves. Oh, I switched couches with the living room and den simply because this couch is so much more comfortable and he likes it better. So the newly upholstered couch is in the living room where decorating changes for fall will start soon. I'm ready, so tired of this intense heat, even though summer is our favorite time of the year. Anyone else ready for fall? My husband went to an auction at the beginning of the week and picked up a few things that he loved. Here's one of them. It's an old minnow bucket! Fishing isn't one of my favorite things, but it's one of his, so, when he walked in with this, I LOVED it. I loved seeing how excited he was about finding something for him. My husband is a very thoughtful person and is always coming home with things for the kids or me, or the neighbors or our friends. So this was pretty special. And you can't help but love the bright happy colors and graphics. I like it so much that I'm using it for my starting point for the rest of the space. He also picked up a chippy green one, which is so cute, and believe me, I never thought I'd put the word cute and minnow bucket in the same sentence. Here's the other side of the bucket. How neat is that bright little red and white measuring guide across the bottom?! I've only got one more thing to pick up for the room, so, hopefully, I will get to put everything together for him this weekend and blog about it next week! I know he can't wait! Have a great weekend everyone! I used what I had on hand, which was barn wood, for the back, attached them to the wall with a nail gun and then, with a table saw, ripped a few strips off another plank to use for the top and bottom trim. For the pegs, I used oil rubbed bronze door stops from Lowe's. (Sorry for the blurry photo.) These only cost $1.88 each and were easy to do because they just screwed right into the wood. I didn't like the white tip so I spray painted it with Rustoleum oil rubbed bronze spray paint to match the rest of it. And since I love jute twine and use it for everything, I wrapped some around one of the rolling pins to make a nifty dispenser and add another layer of texture. 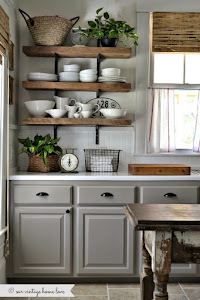 I seriously would love to do my whole kitchen in barn wood. I considered using it for our backsplash before I decided on beadboard, but it was going to be a little tricky with pulling electrical outlets forward to accommodate the thickness of the wood. I'm super scared of electrical outlets and won't mess with them. It's right at home above our vintage spice cabinet. I actually sat in here and stared at it for an hour after I was done. It made me so happy! What do you think? Happy happy Monday! Enjoy your day! Happy Friday to you! I picked up this set of vintage linens at a flea market the other day. The set includes a tablecloth and 4 napkins. Aren't they pretty? I sure think so! I thought they would be fun to use with a summer dessert I made for a few friends who came for an afternoon visit. Stuffed Peaches with Fresh Whipped Cream. 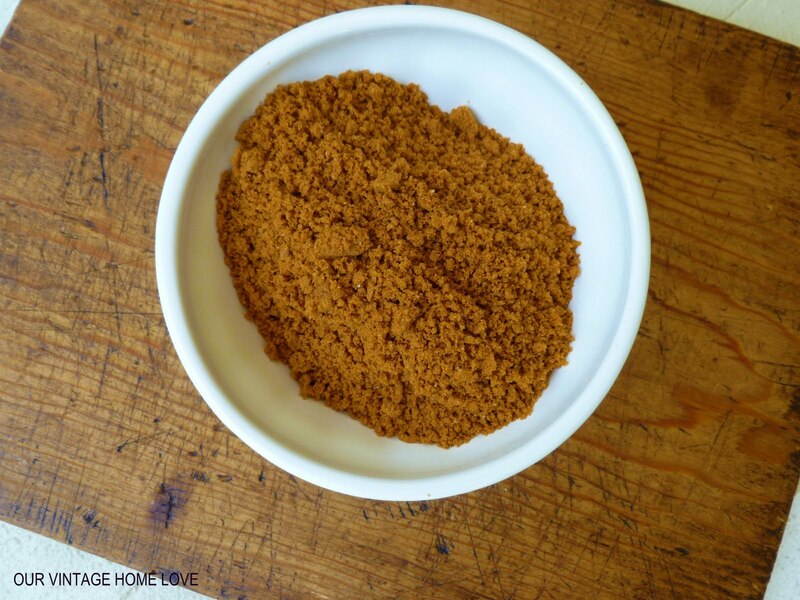 This is an easy, fast dessert with very few ingredients, but oh so delicious. First up, juicy summer peaches! First, take half the package of cookies and put them in a food processor to crumble them up. Or you could just stick them in a ziploc bag and use a rolling pin to smash them up until they look like this. Set the crumbs aside and grab 3 fairly large, firm peaches. Make sure they are firm as they will be going in the oven and they need to be able to hold their shape. Slice the three peaches in half and remove the pit and a little bit of the flesh around it with a melon baller. Place the 6 peach halves in a buttered baking dish. 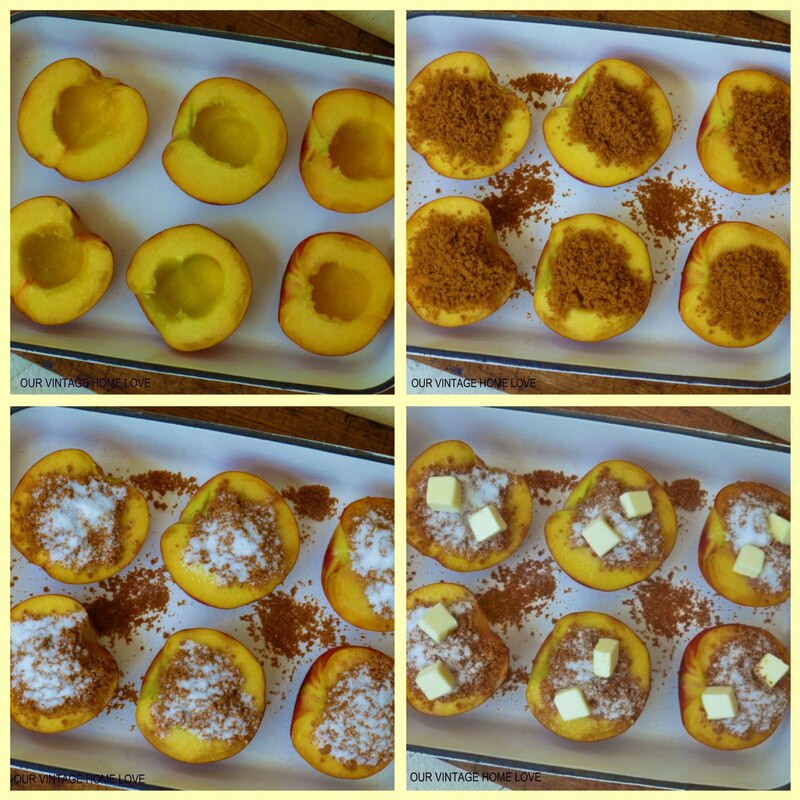 Spoon a tablespoon of crumbs in each peach. Sprinkle with sugar and top with a little butter. When you're ready to serve, spoon a dollop of cream onto each peach half. If they are a little warm from the oven, that's even better because the fresh, sweetened cream melts into the yummy peaches. So good!! Hope you all have a nice, relaxing weekend! Anybody working on any fun projects? Hey there! We participated in the I Love Thrifting Day this past weekend and Hubby and I found all kinds of great things! Check out our loot! 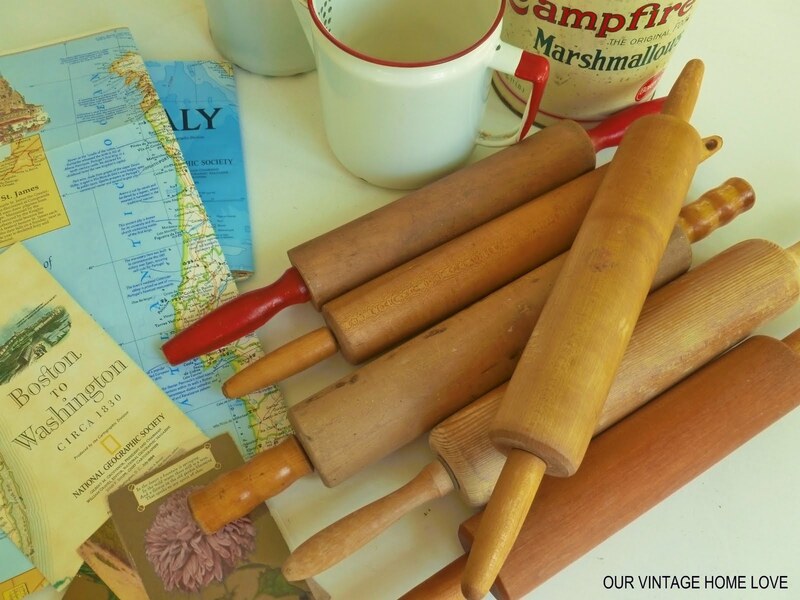 I'm sure most of you know by now that I LOVE anything vintage for the kitchen and I was so excited to have a friend alert me to these wonderful rolling pins! We got the lot for only 20 bucks! I have something fun planned for them in our kitchen, I'm so excited about that! Aren't they beautiful?! Hubby and I love vintage maps and so we grabbed these up, along with some vintage post cards from 1910 to add to my collection. Super fun! The maps were a quarter each while the vintage postcards were $2.50 each. One of these maps is a map of Queen Elizabeth National Park in Uganda and is dated 1965. I just think it's really cool so I'm planning to do something fun with it for our den redo. The colors in the map are lovely, aren't they?. We also scored some more vintage yard sticks to add to my always growing collection. Thinking about a really cool idea using the yardsticks for my little guy's room. He just loves them! And last but not least, we picked this table up for just 22 bucks! It's all chippy and perfect! I didn't have to do anything to it. I have no idea what I'm going to do with it, yet, but I just couldn't pass it by. The color is amazing and so is the green paint peaking through on the legs. Here it is with the sides down. Isn't the texture great on the top? Love, love, love everything we picked up! Each find will add a special touch to our home! What are your favorite thrift finds? P.S. Stay tuned for a fun, yummy recipe to make with your summer peaches!